If you’re on a tight time schedule and you want to fit in as much as you can in the North and South Island then getting from Auckland to Wellington in 4 days is going to be a challenge with so much to do but we’re pretty confident we’ve mapped out a great little adventure for you. No time for hanging around – let’s GO! Although you’ve only got 4 days to get yourself down to Wellington, it would be rude not to check out NZ’s largest city, home to 1.3 million people and known as the City of Sails. After a nice stroll in downtown Auckland, checking out the Viaduct area and maybe grabbing a bit to eat it’s time to get to know your new hire car a little better. A perfect place to start is to head out west through the suburbs and out to the Waitakere Ranges. With heaps of tracks through the lush forest, there is plenty to keep you busy here. If walking is not your thing, keep driving through the forest and end up at one of the superb west coast beaches like Piha or Muriwai. The surf’s good out there and the black volcanic sand makes for an interesting day at the beach. We know it’s only been half an hour since you left Auckland but it’s already time for a pit stop – an ice cream pit stop. The Pokeno store is renowned for the biggest ice creams in the country. Pokeno Takeaways, on Great South Road, will sell you a 15-scoop ice cream (yes, you read that right). Treat yourself. Right, now you’ve filled up on ice cream it’s time to crack on and head to the first big stop of the day – Rotorua. After the 2 hour drive, you’ll be ready for a stop off and there’s lots to keep you entertained in Rotorua. The first thing you’ll notice is the smell (and no, that wasn’t your mate in the back!). Rotorua is New Zealand’s thermal wonderland and that is the smell of sulphur. Wai-O-Tapu – probably the best place to check out the geothermal rumblings including the world famous champagne pools and the Lady Know Geyser. Basically this means chucking yourself down a hill in a giant inflatable ball – not much more to it but it is a lot of fun! 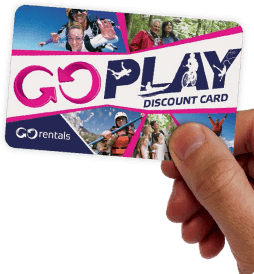 Zorb are a GO Play partner too so discount card at the ready! Well, if you’re like us you will probably have had enough of that smell by now so it’s time to hit the road to your final destination for the day – Taupo. A great stop off on the way into Taupo is the rather impressive Huka Falls. Here you will see water flowing at a rate of 220,000 litres per second (that’s a lot by the way) down to the Waikato River below. We don’t think a salmon has ever made it up there but we’ll leave that up to you to debate. Lake Taupo is New Zealand’s largest lake and is a pretty impressive sight. Hopefully you’ve arrived of the Rings fan, make your way out of town along Desert Road where you will get to see views of Mount Ruapehu which is probably better known as Mount Doom. Finally, why not round off your action packed day with a skydive over the lake. The views are sensational as you plummet from 13,000 feet and Taupo Tandem Skydiving is a GO Play partner who will give you a 5% discount for the pleasure of throwing yourself out of a perfectly good aeroplane! From Taupo, we have over three hours to drive before we hit our next destination: Whanganui. There’s plenty to see in Whanganui so you’ll have to be a bit selective. We suggest a look at the Cooks Gardens, on St Hill Street, right in the centre of town. These are famous because they were the location where Peter Snell ran the famous sub-four minute mile in January 1962 (that’s crazy fast). If you’re feeling particularly fit, you can try attempting your fastest mile time here too, right where Snell did it in front of 13,000 people. Before you head to the airport to drop off your car, we suggest you park on Wexford Road, on the north-eastern side of the airport. On a typical windy Wellington day, you’ll have the chance to see what you escaped from, making the very wise decision to drive down from Auckland. Planes taking off and landing in Wellington often sway a little more than they should – a little scary for passengers on the plane, a bit of fun for you safely watching from the comfort of your rental car on safe ground.